When someone tells you they’re running out of hard drive space, the first thing you would probably tell them to do is to clean up the system using a program such as CCleaner to remove all the junk and temp files which can take up a few Gigabytes. Uninstalling old software might free up some more depending how many useless programs they have installed. Even after doing those things, your system might still be left with less that 10% free space remaining and Windows doesn’t really like that. Other areas of the drive might have been filled in folders you wouldn’t normally look in. For instance, the \Windows\SoftwareDistribution folder can take over 50GB of space and that folder is not somewhere you or a cleaning program would usually check. The standard thing to do would be to check the properties of each top level folder and navigate your way down until the culprit files and folders are found. This could certainly waste a lot of time and isn’t efficient. Thankfully there are much better solutions for how to find out what files and folders are taking up hard drive space, and here’s a selection of 8 free tools to do just that. 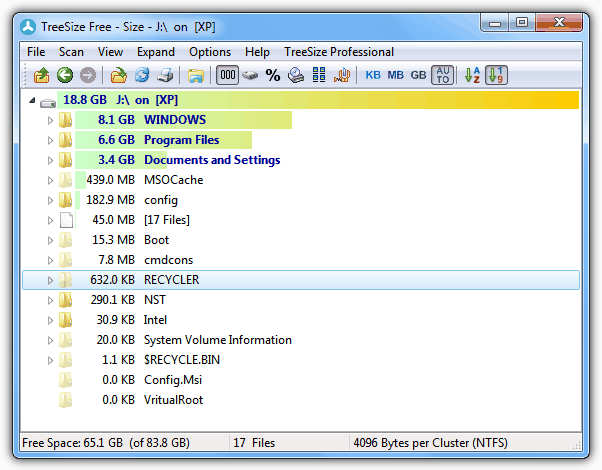 TreeSize Free is a popular tool because it’s fast and within seconds gives you a fair idea which root folders are taking up the most space. 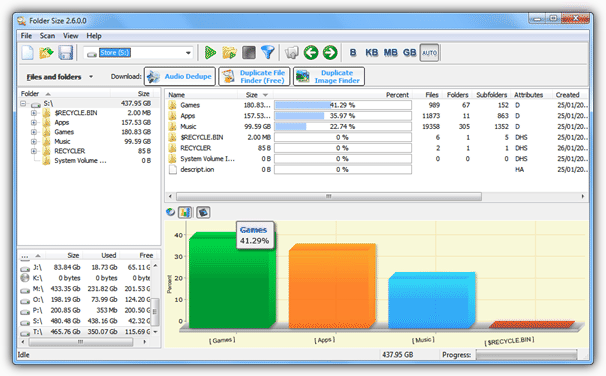 The occupied proportion of space each folder takes up is show by a series of graphical bars, and when you click to open each subfolder, the same bar layout shows the space proportions for that folder. 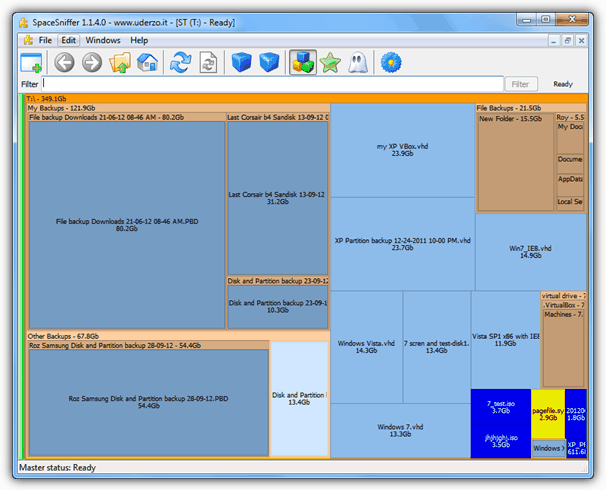 We’re big fans of SpaceSniffer because apart from being fast, it’s visual treemap layout can quickly give a very good idea of which files or folders are taking up the biggest amount of space on your drive. This has an advantage over software that only shows a bar or pie chart etc, because you can already see several layers down, so a massive file buried inside multiple subfolders is instantly visible. The 3 little box icon also shows different types of files in different color boxes, this can also be configured or added to if you wish. For example, the bright blue boxes are archives and disc images, and the yellow are exe’s, dll’s and sys files. SpaceSniffer is a portable executable and works with Windows XP and above. To scan simply press the yellow folder icon in the toolbar or click on the favorites button which should have your drives and any visited folders listed for quick access. The scan is fast and a report can be saved in an HTML / XML or CSV file. The size bars can also be changed to different preset colors which is useful as the default blue stripe isn’t great. RidNacs isn’t portable by default but can be made so by extracting the installer with Universal Extractor. The website is also in German but the program is easy to use and can be downloaded from somewhere like the Softpedia link provided below. The free version of Folder Size is still perfectly usable but lacks a few features because they’re included in the shareware versions; filters, export results, scanning over a network and command line options. If you have Adobe Flash installed, you get some nice animated bar charts or pie charts to represent the used space percentages. Start the program and choose the drive from the drop down and press the green scan icon, or a folder using the green / yellow icon. Information isn’t available until the process has completed which is pretty fast, and then you will get both a text based view of the folder sizes and also the graphical view, either of which can be turned off. Then simply navigate your way around to see which files and folders are taking up the space. If you’re someone who likes to digest large amounts of information then Xinorbis could be for you. This is because it analyzes and gives you information for just about everything that’s occupying your hard drive space and the data is displayed in a number of different ways. There are separate windows for things like file types, extensions, history and size levels etc, which have text based and bar chart or pie charts graphical displays. Xinorbis sometimes looks as if it’s crashed, but usually that’s just because of all the information and data being being read in. Installer, portable and also a useful command line version is available for download. Compatible with Windows 2000 and newer. This program’s interface looks rather messy when first started because there are 3 lists open with each having it’s own set of icon buttons. Expand the window or close the file and/or drive lists and it starts to look much better. GetFolderSize is mostly text based so you won’t get to find out what is eating your hard drive space as quick as you would with a tool like SpaceSniffer, but extra options such as scanning optical media, network shares and hard links or junction points make it very useful for slightly more advanced use. Each list can be individually saved or printed and once you have the layout to your liking, there’s a lot of useful information to be found. 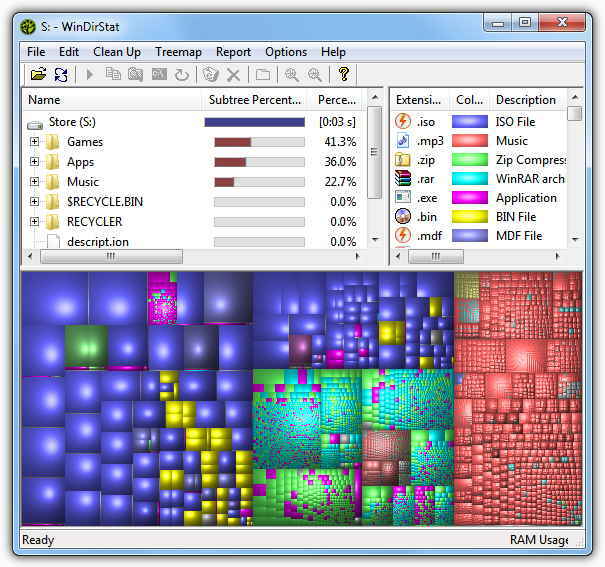 WinDirStat is another tool to use the treemap visual interface which shows you the size of individual files by displaying them as a series of boxes to represent their space on the drive. There are some useful extra functions such as opening a Command Prompt at the location you’re clicking on or emptying the recycle bin before a scan to remove any large files not fully deleted. WinDirStat works on just about any version of Windows right back to Windows 95. Although the website doesn’t host a portable version, you can get it at PortableApps.com. JDiskReport is a tool that runs using Java meaning you need the Java Runtime Environment version 5 or newer to use it. What’s quite good is the different ways in which you can visually view the information. For instance, the size of a folder or drive can be displayed as different looking charts such as a pie, ring, bar or a details list. The color of the charts or the interface look can be changed and a context menu menu option can be integrated into Explorer. Important Note: Unless you’re very sure that files or folders can safely be deleted, don’t delete them from within these programs. Just because it might be taking up lots of space, you need to check first that it’s not part of the system which could cause a problem if you remove something that’s required for running Windows. I use Large Files and Folders Finder+. That is the only app that does the job. It finds large files and folders. It returns the complete report and works very fast too. It has some additional features such as Disks Watchdog. Hi actually none of them check dept of Path (directory levels) as I can see , but is ther som good tool for that on w2012? Gave WizTree a go tonight. It does not report accurately at all. I noticed it when I scanned the hard drive I use for all of my games. It was showing many directories as having 100MB, less, or even 0 bytes, when each are in the multiple GB range. I just used it on a drive that contains most of my games (1.2TB) and it detected everything correctly. It’s possible it could be something like UAC or permissions that is causing your issue? I tried a few of these – spacesniffer was the one I liked best! I still use the free “SpaceMonger”, and skimming over this post I know exactly which one I want. That style of display is by far the quickest, as you literally see everything. WizTree for the win. Is the fastest hands down. I have spent days trying to remember the name of this. I kept looking for wizard tree! I agree this is by far the best one to get an overview of everything. thank you! i’m using windirstat. faster to scan and easier to read than some other (not listed above) softwares. WizTree is an interesting one, working off the MFT, so its fast (& free). thank you for the information, I’ll download one of the software. Amazing tools list! My work is more easy now. Thank you very much. Such a wonderful post!!! It helps me a lot. Great post! Thx. Another free tool of Hard Drive manager for you! With this utility, you can create, format, resize and delete the parition. Totally free for home users. Download free here. A similar product is sequoia view, also very easy to use works fine on xp and win7 (only tried it on these two). I do reccomend it`s usage. Such a wonderful post!!! It helps me a lot. Thx. Thank you. 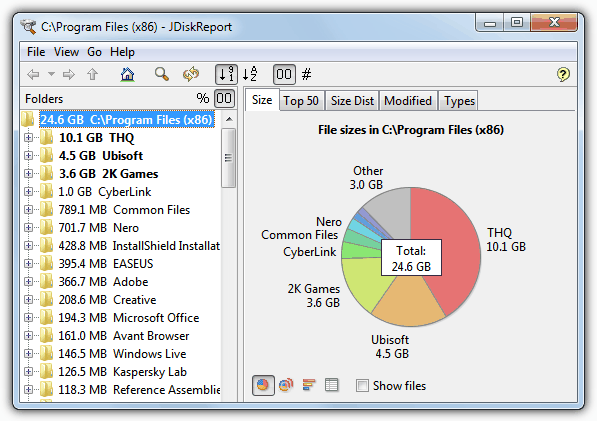 in Ubuntu i use disk analyzer. Something funny going on though, this article is dated Oct 16 this year, but there are comments from two years ago? Well spotted Mr.Bigglesworth! This post is actually a 100% totally new article that replaces an old post with the same subject from 4 years ago. Raymond is going to write about the reasons for this and other things such as the new theme hopefully in the next few days. As Treesize and JDiskReport were in the original post, any commments that can stay were left in. Great post! But isn’t there any tool that gets embedded into windows explorer so that a live status can be obtained!!! WinDirStat is my favourite but thanks to your article I’ll now try some of the others on offering. Keep up the great work, Hal9000. Always a buzz to get ideas from this site. what a great tip, how come the people whom created the Vista, Outlook don’t know it…. I found 2 monstrous sized Hotmail files for MS Outlook! So I moved them to E drive instead of C. Freeing C drive with additional 10 GB. Thank you so much! I was one of the people who got CCleaner and started wiping files and defragmenting my disk for small amounts of space, going through my official list of programs and finding nothing that takes up that much space, or finding things that take up space that i still use. You saved me so much space. Thank you. Hi, thank you soo much! after a couple of months of wondering where approx 150GB had gone, this Free and easy to use program showed it up in minutes!! i am no PC expert and this is a fantastic program which works well…thanks again! Excellent software, does exactly what it says on the tin, simple to use and easily installed. Many thanks for sharing it. WOW. This program rocks. I did a complete reformat and thought all my pics which I backed up onto an external hard drive would have been wiped out. Was driving me crazy why I only had 2 gigs left on my hard drive. All my pics and programs were still there. This sotware found it all and allowed me to clean up my computer. This ought to be on cnet to download bet you could get a million downloads easily. Thanks again. Thanks SO much! I used JDiskReport and freed up 88GB of space!! I had no idea one of my programs was keeping backups of projects! Thanks again! This is the best tool EVER!!! Ive regain 50 gb hardisc space using this and i loove it! thank u thank u thank u!! !